The Grand Theatre in Salem, Oregon, was renowned in its size and capability to show a variety of entertainment. Advertised as having a likeness to Portland and Seattle show houses, no other venue could surely compare. Still, a 1922 issue of the Capital Journal displays a page plastered with advertisements for many different theaters in the area, so how did the Grand stand out from the rest in a time where the Nickelodeon appeared everywhere? One successful tactic used by the Grand was the proliferation of ads on the newsprint. For example, page ten of the Capital Journal features at least two very large ads for the Grand, while other theaters such as the Bligh and the Liberty theaters only feature one each- at a size much smaller than the Grand. Interesting too, is the switch in advertising style. In this 1922 ad, the list of actors and their respective parts are displayed- a sign the industry was star-studded. Before, ads of the Grand featured its massive stage, plush seats, and its ability to show a multitude of entertainment, from vaudeville to moving pictures. The subject of the ads are also of interest. 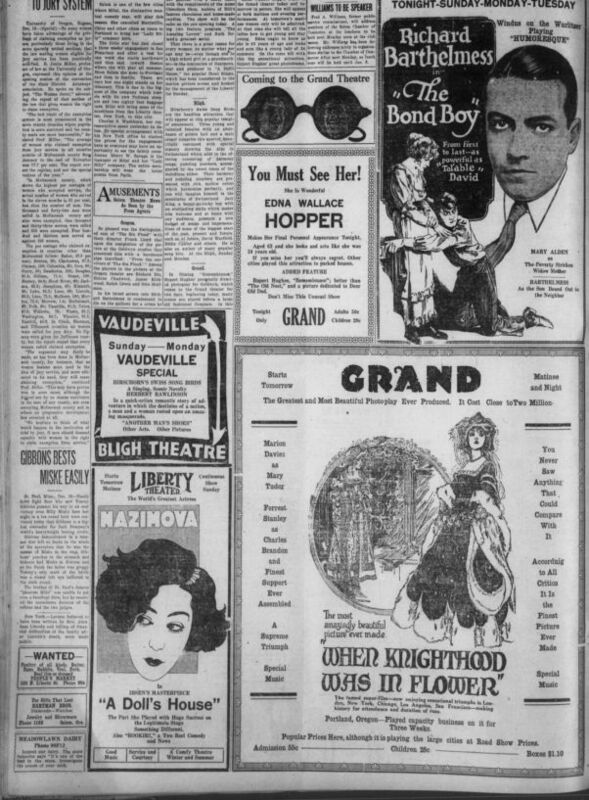 Both ads for the Grand theater feature women, either illustrated or mentioned, as the tactic to get audiences in. One ad reads, “Edna Wallace Hopper makes her final personal appearance tonight. Aged 63 and she looks and acts like she was 24 years old.” Another features a list of actresses that audiences won’t want to miss. While this overt objectification of women was probably prolific for the time, it may also help to determine the audiences these movie houses were trying to obtain. By the ads alone it may be apropos to assume these theaters were advertising to the working class male- able to fit in a show of beautiful women on a day off or between shifts with whatever extra money he may have earned. For Pendleton, Oregon, “the Pastime Theatre is the pioneer moving picture house in the city.” Besides being able to see a moving picture, the place in which you see it has a profound effect on the viewing experience overall. According to Ina Rae Hark, “Many aspects of exhibition sites work subtly to construct he viewing experience…” (Hark 2). The ad from the East Oregonian delves into all of the fantastic qualities audiences can enjoy besides being able to see the latest moving picture. In the early nineteen hundreds, exhibitors cared little about the programs and more about the environments that housed them. Hark continues to describe that the exhibitors intent was to “…[overwhelm] their customers with elaborate architecture and interior furnishings…live stage shows…” (Hark 4). Inside, it was lively; sounds of laughing and music playing made the theater anything but silent. The ad continues to list its own shining qualities to draw audiences to choose the Pastime Theatre as their moving picture house. 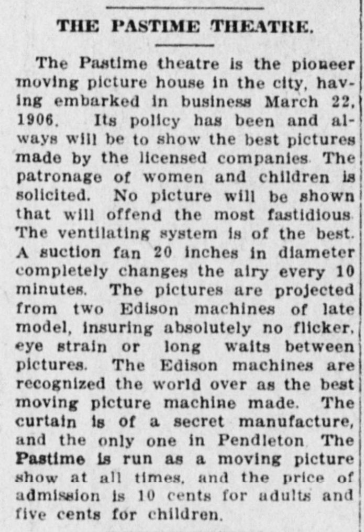 Before boasting of its Edison Machine: “…recognized the world over as the best…” it highlights the use of a large suction fan that filters the air every ten minutes, and that their curtain’s origin is a secret of great importance. In short, the ad speaks more to the environment of the theater and its glorious new technology and finest details that makes going to see a moving picture worth the price of admission. In fact, the Pastime Theatre is the only theater in Pendleton to show moving pictures at all times for the price of ten cents for adults and half of that for children. It was important that the Pastime Theatre stand out, and the ad reaffirms its “onlyness” by emphasizing the latest and greatest: the use of two Edison machines-not just one, filtered air, and a promise for no waits between films, or eye-strain from flickering projections. This is truly the greatest in moviegoing. Hark, Ina Rae. Exhibition, the Film Reader. Routledge, 2002.